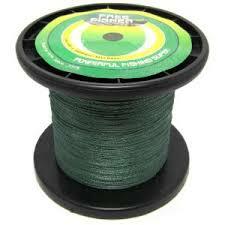 Fishing line should blend in. These can be used at your home, bugout location or in a campsite. They can be as simple as a tin can hanging on a line with rocks in it and trip wires. Because my hearing is not very good, I recommend cowbells. You can often find them in thrift stores or garage sales and they make lots of noise. I recently saw cowbells on sale at a local feed store for $2 each. Depending on the size of the cowbells, they can be quite loud and may scare someone off. Just remember if you have one tripped you need to make changes to your layout, they may come back. Using YoYo fishing traps for early warning systems. 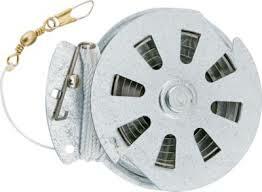 They are a spring-loaded wheel with approximately 12 ft of 60 lb test line with a swivel on the end. For most uses, you tie the reel to a tree or other solid anchor point. You then stretch out the line, which turns the wheel compressing the spring. When you get as much line as you want out, there is a small latch that you place in one of the notches in the wheel. When the line is disturbed, it trips the latch and the spring-loaded wheel reels in the fish. You would normally add more line to the trap. However, they have an alternate use. They will work well as early warning systems. Simply take a can full of rocks and stretch the string across the area you wish to protect. Set the string at ankle height so that any disturbance will trigger the YoYo fishing reel. You can add fishing line to lengthen the string. When the YoYo fishing reel retracts, it will cause the can to fall or shake, warning you that someone is in the area. There are many other ways that you can use this to trigger a warning, even using it to trigger electronic devices. You will notice that these are all noise making devices; I am not recommending any devices that can cause bodily harm. 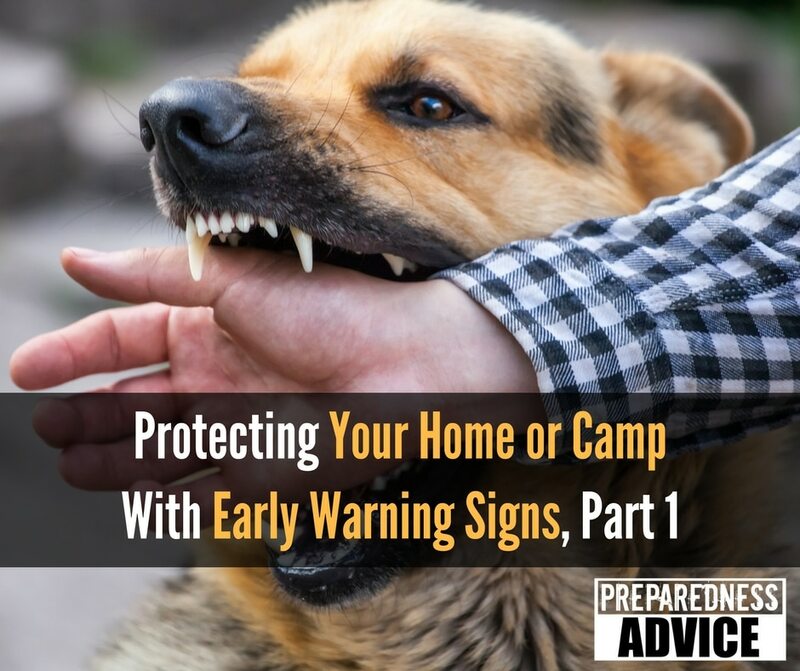 These are just a few of the many possible ways you can rig early warning systems to help protect you from intruders. Today we have just discussed low tech methods, in the future we will post an article on higher tech methods. This entry was posted in security, self defense and tagged early warning system, security, trap. Bookmark the permalink. X-10 home security systems have excellent motion detectors for indoors or outdoors, and Amazon and Harbor freight have some good motion detectors that work well. When my brother was in the Marines, they used empty K-ration cans (two together) tied to fish line and surrounded their camping spot with this system. However, the rodents liked the empty cans, and kept them up all night by jumping on the cans to get at the leftover food. You may want to ad bubble wrap that gives off the snap sound that doesn’t blend with any noise in nature. It is cheap for it costs a dollar at the dollar store. under the center of a throw rug that is normal in a home it wont be detected like the fishing line that can reflect the tight beam flashlight. i like this idea. very simple and cheap too. I use cheap sensor lights which I removed the bulbs and attached wires inside my house, to a diagram of my property, with small indicator lights representing where the sensor is located. When one, or more, of the twenty-six lights come on a quick glance at the diagram will tell me where something may have triggered the sensor. If there is a power failure, I plug it into an inverter attached to a four twelve volt batteries as a backup. I buy these at hardwares store when on sale. Some of them sell for less that three dollars each. I wish you would explain this in more detail as I can’t visualize how you’ve done this. This is what I have been wanting to do for some time, but haven’t figured out how to do it. I would also like to see this setup. Tx! Hey Jim – I agree with John’s reply. This sounds like an awesome setup, would love to learn more about how exactly you did this & how well it works for you. I will set some up in my back yard and take pictures in the next few days. This sounds like a great idea. Can’t wait to see what this set up looks like. Any terrier will be your best alarm. We have Jack Russells & they are loud & tenacious. They’re also very smart, easy to train. We’re with ours almost constantly & we can tell the difference in their barks; there’s “oh, mama’s home”, “yippee, squirrels”, and then there’s “I’m gonna rip your leg off!”. They’re small, quick, & difficult for an intruder to see long enough to neutralize. Just came across this article and it reminded me of another article on home security (can’t find it right this minute). Anyway, the author was talking about a mil surplus item that could be used to “fire” .22 cal blanks when a trip wire was disturbed. 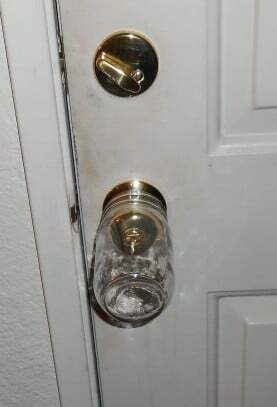 This is a great idea, especially if you’re setting these outside your home or the perimeter of your property. They won’t hurt anyone, but, can be heard quite well from a distance (or inside your home). I too would like to see a follow-up to the post on the diagram to indicate intruder locations. any followups on the above mentioned diagram? Sounds like a great setup! Set your trip wire to a rat trap (large mousetrap) that strikes onto nails driven through the trap. On top of these nails fit percussion caps that are used on black powder firearms. When the tripwire is struck it will set off the rat trap striking the percussion caps. Bam!! The glass jar one is stupid! Who wants to wake up to shattered glass on your tile?! Or any time?! As a cheap method of early detection, the jar on the doorknob method is something I have never seen and is fantastic, essentially it’s a early detection device you can carry and use at a moments notice. Thanks for this tip!